To sum up, GHAJINI is commercial Hindi cinema at its best. The film has 'Hit' written all over it. Let me put it this way: Cancel whatever you're doing today and go watch GHAJINI instead. The wait is finally over! An Aamir Khan film is nothing short of an event. The supremely talented actor acts in one film a year and no two films are ever identical in terms of plotline. No wonder then that you await an Aamir starrer with bated breath. GHAJINI, the Tamil version, has been a massive hit and so was its dubbed Telugu version. Will the Hindi adaptation live up to the humungous expectations? The hype is unmatched and you expect no less than a present-day masterpiece. Now the good news: GHAJINI demonstrates how strong film-making can enhance and elevate an already solid concept. 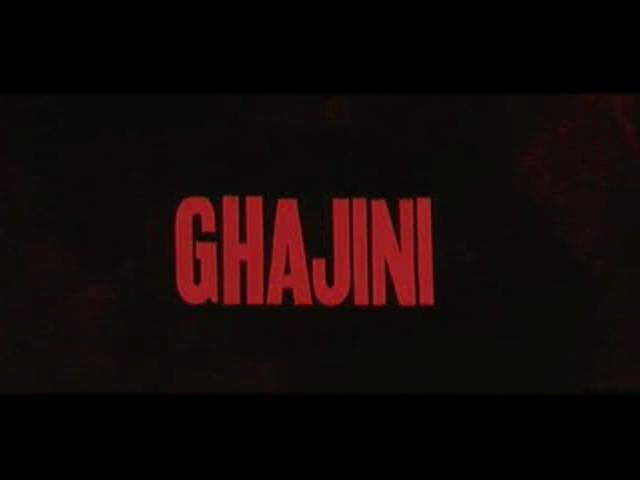 GHAJINI is a revenge saga, one ingredient that has been the staple diet of Hindi films since time immemorial. It is a powerful film. It has the power to sweep you off your feet from the word 'go'. It has a riveting story, which has been told with flourish by director A.R. Murugadoss. And, of course, it has a knockout performance by Aamir Khan. If at all there's a shred of doubt whether Aamir is The Best in the business, all you've got to do is check out GHAJINI. Flaws any? Running time [almost 3 hours]? Not at all! There's so much happening in every scene and the screenplay is so gripping that you don't feel the need to look at the auditorium ceiling or at your watch at brief intervals. You aren't restless. As moviegoers, we've watched countless good versus evil fares over the years and although GHAJINI belongs to the same family, not once does it take the beaten track. The story has been told differently and most importantly, the story offers so many twists-n-turns that you just can't guess what would unfold next. Is it violent? It is, at times, but the violence here is justified. In fact, every time the protagonist bashes up the evil-doers, you clap and root for him. The climax is jaw-dropping -- dissimilar from the original, but it's an out of the world experience nonetheless. To sum up, GHAJINI is commercial Hindi cinema at its best. The film has 'Hit' written all over it. Let me put it this way: Cancel whatever you're doing today and go watch GHAJINI instead. Aamir Khan is suffering from acute short-term memory loss set off by the violent murder of his girlfriend Asin. He's got to work around this handicap, but with methodical and meticulous determination. Aamir etches a path of clues that lead him on his road. To aid him in his quest, he carries around a sheaf of Polaroids and when he is really sure of a piece of information, he has it tattooed on his body, which stands in for the damaged part of his mind. His indelibly marked torso is the repository of his grief, his rage and his reason to go on living. Any more revelation would do gross injustice to the film and to its viewer. First things first! GHAJINI is not MEMENTO. There're minor similarities, but GHAJINI takes a completely different route to tell its story. Director A.R. Murugadoss tells this one differently. It starts off with what happens in the past, comes to the present-day, goes back in time again and returns to the contemporary again. This is a breathless, exciting story, heart-breaking and exhilarating at the same time. Hindi movies have often depicted people suffering from amnesia/memory loss, but GHAJINI is poles apart because the protagonist recalls events only for 15 minutes. The story is its USP, without a doubt. But what adds sheen and glory to the story is Aamir's portrayal of a man suffering from short-term memory loss. Aamir hardly speaks. In fact, the leading lady [Asin] speaks more than Aamir in the film. But Aamir speaks volumes with his eyes, he conveys whatever has to be conveyed through his body language, he says it all with his facial expressions and that only makes GHAJINI a memorable, never-seen-before experience. Director A.R. Murugadoss deserves brownie points for not just coming up with an interesting story, but also presenting it [refreshingly] differently. The storyteller balances the light moments and the ones demanding intensity with expertise. There's dum in every sequence. Even if the director has to depict violence, he doesn't resort to blood-n-gore or knives-swords-pistols for effect. A.R. Rahman's music is top notch. At least three numbers have the unmistakable stamp of a genius -- 'Guzarish', 'Behka' and 'Kaise Mujhe'. Ravi Chandran's cinematography is stunning. The film bears a stylish look all through. The action sequences are brilliantly executed. The Hindi moviegoers haven't seen such scenes ever. Aamir delivers his career-best performance. In the first place, it requires courage and maturity to name the film after the villain. Knowing how egoistic our stars are, something like this is next to impossible in Hindi films. A lot has been said and written about the GHAJINI look -- Aamir's hairstyle and his dream physique. It's awe-inspiring and if more and more people adopt the 'Aamir look' or hit the gym, it would be courtesy the actor. As far as his acting is concerned, he's natural as the tycoon, but like a wounded, ferocious tiger when he goes on an avenging spree. Without doubt, it's a concentrated, layered performance. He acts with his entire being. His body movement, the details of his performance, everything rings true. He is both vulnerable and hard. The pain in his face when he can't remember, is palpable. It's not only the plot that carries GHAJINI. It's also the mood and the expression on Aamir's face that makes GHAJINI a treat. Asin is fabulous. To share the screen space with an actor of the stature of Aamir Khan and yet remain in your memory even after the show has ended is no cakewalk. She looks fresh and photogenic and acts her part brilliantly. Pradeep Rawat, the villain, is first-rate. Jiah Khan impresses, especially in the sequence when Aamir follows her to a shopping mall. On the whole, GHAJINI is a winner all the way. The film will set new records and has the merits to emerge one of the biggest Hits of all times. The weekend business should be historic, the Week 1 business should be unparalleled, the lifetime gross should be amongst the biggest of all times. In short, GHAJINI has 'Blockbuster' written all over it.